IT Ops Girl Friday by day, wannabe Writer by night who's attempting to finish just one of her many novels. Follow the saga on Wordpress! A quiet spot for reading, napping or watching the sunset on the fictional Guardian Grove Winery, Stables and Ranch that is the setting for my new novel, “Take A Chance”. Well, I know it’s been a while since you’ve seen me around the blogosphere. 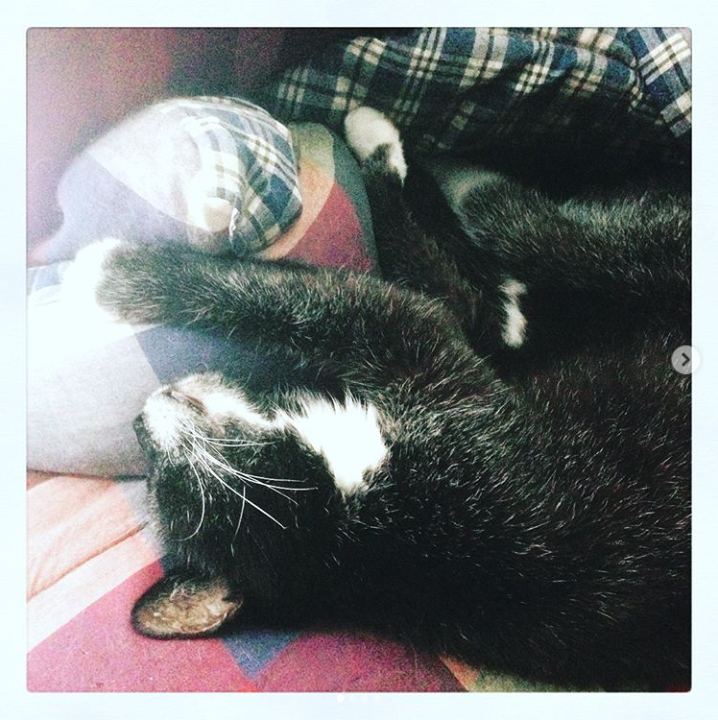 Having to unexpectedly say goodbye to my beloved 20-year-old kitty in June really threw me off the rails, and I still haven’t quite yet gotten back to normal. That’s why July Camp fizzled miserably, and my finished proof- and copy-edited novel is still in the crate it traveled in to our writers retreat awaiting its edits to be transcribed. But the calendar has flipped to November once again and that means it’s time for that annual event they call NaNoWriMo. Thanks to my sister-of-the-heart BFF, who has lovingly pestered and cajoled and hounded me for the last month, I completed quite a lot of NaNoPrep in October. Fortunately, I had a project that has been bugging me for a while now, so I decided to see what could come of that idea. A month later, I’ve got a Trello board jam-packed full of cards detailing characters, plot questions to resolve, background notes, miscellaneous to-dos, and even a full set of the series’ book covers I created in Canva. With cards that link to outlines, character profiles and draft documents in my OneDrive cloud storage, everything I will ever need to work on this series is all in one place. I even found time to add the series pages to my blog’s “nik’s novels” section, although I still have half of them to go. So here’s hoping that writing 50,000 words this month will kick start the rest of my life and some normalcy returns. I know that sounds counter-intuitive or ironic or some other term, but if I believe it, that’s really all that matters. That second card under the book cover titled First Draft links to that file so I can pick up where I left off from the board. Neat, huh? Hi everybody! Today’s been productive, even if I don’t completely feel like it has. I’ve posted both #BohoBerry and #InstaWrimo challenge photos on Instagram, procrastinated by updating some background information on my shapeshifter mythology (got to get those species correct in case I need them), and hit my daily word count goal. I admit, I was totally ready to say “I’m not feeling this” and give up and go do something else and put it off until tomorrow. Fortunately, I have this best friend who’s not going to let me get away with stuff like that, even when she’s out of town at a baby shower. So, a “rah, rah, go Nikki” text later and I have my words in. I think it’s always tough to pick up an old story after letting it sit awhile (like since 2014). Even after reading what I’d written before, and having storyboards to tell me what comes next, it wasn’t as easy as picking up with COC had been. In truth, though, that story never really let go of me, and to some extent still hasn’t. That novel was always in the background, saying “write me, write me!” while this one isn’t quite as demanding. Whether that’s due to having way more romance novels on the list than fantasy ones, I can’t say. But I agreed to stick with the fantasy genre for Camp, which is part of the reason I gave myself a decent but not intense daily goal. This time, though, let’s see if I can’t move the action along a little faster instead of getting bogged down in the descriptives. :) See you tomorrow, campers! You’re not imagining things, it’s really me! First and foremost, the big news: I. Finished. Writing. My. First. Novel! Yes, you read that correctly. Last November 30th at the end of NaNoWriMo, I wrote the words “The End” on the last page of my manuscript for Curse of Camelot! I was with my bestie, and the second after typing those words, I clapped my hands over my mouth to keep from screaming out loud. Meagan, of course, knew instantly what I’d accomplished, and she grinned at me. A moment later, we were boogieing like idiot teenagers. I took the next four months off until I half-heartedly attempted to participate in April’s Camp NaNoWriMo to edit the rest of COC. I failed miserably, and the manuscript sat another month and a half until Meagan and I went on our second annual Belletristes writing retreat in Fredericksburg. Having already spent nearly three weeks without air conditioning due to a busted compressor, I was more than ready for time away from home and getting back to writing. Two momentous events happened that week, the first being my second big accomplishment with Camelot: I completed the copy edits of the full manuscript on 7 June. Another boogie session ensued with my bestie, and I celebrated by tossing the original first draft pages into the air for one of my Instagram posts. Then we each plowed through a pint of our favorite ice cream while watching my favorite movie, Ladyhawke. Meagan went to bed early (she was being a good mom and heading back home at the crack of dawn to attend my oldest nephew’s fifth grade graduation) and I stayed up to watch my new favorite dance movie, High Strung, then I too went to bed. Little did I know my world was about to blow up into smithereens the next day. I got up Friday morning, smiled at the note Meagan had left, and ate my breakfast bagel before getting down to work at 7:30. I started transcribing my edits into Word, and broke for lunch around noon. My bestie called to say she’d be on her way back shortly, and I got back to transcribing. When my cell rang again, I picked it up and automatically glanced at the caller ID, and stopped breathing. It was the animal hospital where I was boarding my Molly calling, and I knew they wouldn’t be contacting me if she was okay. As the conversation continued, my heart ached, the tears I cried (okay, sobbed) made me almost incoherent as I tried to comprehend the details being relayed by the on-call vet. The entire time, I sat in the chair in front of the window staring out of it and waiting for my sister-bestie to get back so I wouldn’t be alone in a rental cottage without transportation 78 miles away. You see, my kitty had developed fluid in her chest from her heart murmur or her kidney disease or possibly cancer, and it was hard for her to breathe and she would most likely not get better. So I had to make The Decision all pet owners avoid as long as possible, and I had to do it long distance. I knew what was best for her, and to do anything else would have been horribly selfish. Fortunately, my very good friend works a receptionist at WLAH, and loved my kitty almost as much as me. Caryn was with Molly for me as my baby girl left this world to join Tink in Kitty Heaven, and also agreed to keep her until I could see her one last time on Monday. As you can imagine, my emotions have been on a roller-coaster ride the last three weeks. Some days, I’m the Walking Dead as I shuffle around the house desperately missing my cat. Others, I’m inspired to work on this or that for my novels, and her being gone hurts a little less. Part of why I continued with FMS’s Instagram June Photo A Day challenge was to have something different I could focus on. My July is shaping up to be enormously busy too, what with taking on three challenges simultaneously: 25,000 words for Camp NaNoWriMo, Kara’s bullet journal #bohoberrychallenge, and NaNoWriMo’s #InstaWrimo challenge from April. Here’s to getting back to normal and reconnecting with my shapeshifters. I’ve been away from them too long, and I could use some old friends to talk to instead of a few empty rooms. Good luck in July, fellow Campers. I’ll be back around the campfire starting Sunday, so see you there! Hello everyone! I know it’s been a few days since I’ve checked in, and I thought the start of a new week, and the Monday after a long holiday weekend, would be a good time for it. Well, I’ve just finished writing for the day, and although I didn’t quite make the NaNo recommended minimum, I’m still a little ahead of the game. I’d like to have a bigger word count cushion, and more days like I did on the 10th when I cranked out 3,500 words in three hours. Perhaps I need the delicious scent of chili bubbling away in a crock pot to inspire me. Who knows. Thing is, I’m not quite sure if it’s the characters giving me a hard time, or the scenarios I’m putting them in, or some other outside unseen factor. I know that yesterday during the first library writing session I’d scheduled with M, I had a hell of a time writing the first scene where my guy and girl meet. I knew they weren’t going to get along at first–you know, fine line between hate and love and all that–but I really had a problem with the confrontation. I eventually got past it, but I have to tell you, this thing isn’t moving as quickly onto the page as I’d hoped. Maybe it’s because I’m starting something new instead of sticking with the familiar. Maybe I’m hearing the voices of Novels Unfinished calling to me and I’m having trouble tuning them out. Maybe this romance isn’t as “simple” as I thought it would be. Whichever of these is the answer, I’m hoping it’ll all work itself out. I can tell you that once again I will be nowhere near finished with this novel by the time I hit that 50,000 mark at the end of the month. But every word written today is more than I had yesterday, right? Hi everyone! How was your writing today? For me, it was my second day of double writing sessions, one during lunch and then one after work. I’m once again ahead of the daily minimum count, although I didn’t quite write enough to surpass my bestie. (Yes, we’re that competitive when it comes to word count, LOL.) I can live with that, considering I’ll still have a big chunk of Saturday after ceramics class to put words on the page, not to mention the marathon writing session M and I have planned for Sunday. If you can believe it, we’re going to head out for breakfast at 8 AM, then write as much as we can until it’s time for a late lunch. Sound familiar? It should. It’s very reminiscent of our retreat schedule. I’m hoping it means I can crank out some serious word count and put myself ahead by a lot. A lot, a lot. Next week is also a holiday week with the observance of Veterans Day, so I might get to sneak in an extra session of writing even as Mom and I take advantage of my day off and add an extra ceramics class as well. Ooh, I just realized that my heroine’s best friend herself is a veteran, so I’ll have to give her a shout out next week. As it is, with my evening writing, I finished chapter three. I like it when I can end the day in such a nice fashion. I don’t know about you, but it bugs me when I’m so completely tired and over the day that I have no choice but to quit in mid-scene. That also happens at work when I’m on a time limit and I really want to keep going but the Powers That Be require me to get back to work. Happy writing, friends, and until next time! Well, I hope that you guys had a better writing day than I did. I found myself battling one nasty headache for most of the day. You know the kind I mean–the one that feel like someone’s standing behind you tightening a vise on your head, and it throbs so badly that you can barely think? It wasn’t until that second dose of ibuprofen about 4:00 that it started to let up a little. While I waited to see if it was a momentary reprieve or if it was going to return, I checked my word count from yesterday. Turns out because I did pretty well yesterday, I only needed 370 words in order to meet the minimum Day 2 total. Thank the gods for small miracles. So I got myself a diet soda and my favorite chips from the vending machine and got to work. Or tried to. I think the first ten minutes was me staring at the blank page underneath the words “Chapter Three” trying to figure out how exactly I was supposed to start. Yeah, sure, I have an outline, but the transition to this chapter also meant a location change. I’d already had to tweak the beginning of Chapter Two because it started exactly the same way as its predecessor, and I wasn’t about to go for three. That’s when the memory of one of the humorous arrival announcements I’d heard on a Southwest Airlines flight home years ago popped in my head. Score one for the stubborn. That said, I am going to give in to this headache and go home so that I can write like a crazy person tomorrow at our first official work writer buddies write-in at lunch. Hope you guys hit your goals, no matter how large or small, and I’ll see ya tomorrow. Evening, all. It’s 11:15 PM CST, and I just finished up my second writing session of this first day of NaNoWriMo. It’s been a pretty successful day, despite having my first scheduled write-in preempted by an all-day training session for my writer pals. I stuck to the original plan and wrote over my lunch hour, locking in almost the entire day’s minimum count. Before I could write again, there was work, and dinner with Mom and a couple hours of choir practice for our upcoming Thanksgiving services. So when I got home at 9:15 I was pretty pooped, but I had those couple hundred words still needing to be written before I could quit for the day. I’d hoped to finish in time to start season 10 of Smallville tonight, but considering the jaw-stretching yawns I’ve been having the last few minutes, I think Clark will have to wait until tomorrow. So I’ll leave you with a picture of Frankie’s extremely cute puppy Max, and my word count for the day. You can check my progress in the sidebar widget.